C’mon Christians – Get EXCITED! My sweet Carolina niece captured Rod on stage, Tuesday night of Branson GMR. There are a lot of things that can and have been said about this man, the one I am blessed enough to have as a husband, best friend, and partner. He can be brief. He can be stubborn. Occasionally, he can be a royal pain in the rump :) But he is a wonderful daddy, a loyal friend, a smart and honest businessman, a creative mind, a beautiful singer, and as this pictures shows, a beautiful face attached to a heart that loves, obeys, and gives the glory to His Father. Thanks for capturing this, Emma! I am proud. Back in the ’80s, my parents, along with a million others, discovered Sandi Patty. They adored her music. I thought it was pretty, but I preferred Amy Grant’s “contemporary” style. I remember hearing that Sandi “fell from grace.” It didn’t matter to me then. I felt bad, but I didn’t really get it or have reason to care. Fast forward to 2003. I was sitting on my front porch one Sunday afternoon after church. I was newly married, and while not completing broken and shrinking into hiding, I was feeling enough guilt and shame to be intrigued and buy Sandi Patty’s book, Broken on the Back Row. For several hours, I sat there mesmerized and weeping. Here was a story by someone who couldn’t seem more different than me. She sings for Presidents…and with Gaithers! But we shared a common shame, and I was both sad and soothed to know that I was not alone in my failures. I was also taught, perhaps for the first time, through Sandi’s experiences that God can and will forgive us all – and USE us all. 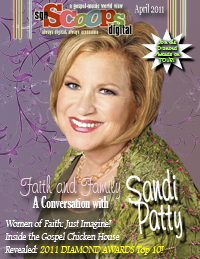 Today, Sandi is on the cover of the magazine of which I am editor-in-chief. While I have not yet gotten the privilege of interviewing her myself, I am so proud to spotlight her accomplishments and her spirit. She is currently touring the country with Women of Faith, likely touching many with her story as she did me. Yesterday, at our church luncheon, I was also privileged to sit and dine with two people who have become personal role models to me. They have not sung for Presidents either, but what they have done is lived a life steady as a beating drum, raising their children, passing heritage to their grandchildren, staying at the same church for 50 years, teaching and serving there. When we talked briefly about the subject of Pasts and Scandals, Mr. B – who spends some of his time ministering and befriending prison inmates – said simply, I don’t need to know what is in the past or what people did. I see them serving the Lord now. And his wife, quiet and sharp-as-a-knife Mrs. B said, If God has forgiven it, there’s no need to bring it up anymore. I have spent YEARS – about 16 of them at this point – continuing to make allowances for things in my past. Though I accept grace, though I believe with all my heart that “Jesus paid it all,” the human in me still clings to guilt like a security blanket. I have been learning, slowly, how to let go and forget those things, and the simple words from my 2 friends at lunch today has driven it home. Thank you to them for their steadfast faith, thank you to Sandi for being brave to share a hard but needed testimony, and thank you, for reading this issue! Click on the SGN Scoops cover to download it! (as well as Mary Poppins, Lilo, Stitch, Buzz, Woody, Mickey, Minnie, Goofy, Donald, & Pluto). 1 favorite MOUSE HOUSE – where we’ve ridden horses/ponies, boats, trains, more buses, rollar coasters for the first time, and laughed ourselves silly. We miss our beds, our car, and our FAMILY&FRIENDS at home. (And I seriously miss my washer and dryer…like, I am going to pet them when I get home). (OK, and what with the fall premieres, I do miss my DVR, too). But we give thanks for a life that takes us the homes of people we love, churches that welcome us, little hidden diners, Flying J truck stops, beaches, mountains, places where the pace is slower, and … to adventurous unknowns, together! We are back to life today – back to working, cleaning, exercising, play-dating, message-answering, basking. Branson Gospel Music Convention 2010 was amazing. There were some tough moments, some hard decisions, some unfortunate fall-out, but this weekend, with friends, we were able to reflect on the Good, and testify to the Great, and begin to look forward to the Next. I am going to be writing more, of course, but my sweet friend Julie Groves shared a photo that for me, embodies the whole spirit & truth of what this event is about. During the last concert of 9, on that Friday night, our friends McMillan and Life sacrificed most of their 20 minute set to pray. For us – for the Burtons, with an audience of a thousand or so. They prayed for God’s protection over our family, for His wisdom & guidance as we follow His call. Jimmy, Liz, Devin, how can we ever thank you for this? We only hope God will bless you tenfold.